I started doing some fun little illustrated "nano" fiction for my cocktail blog, The Martini Diva™ last week and people seem to really like the idea. 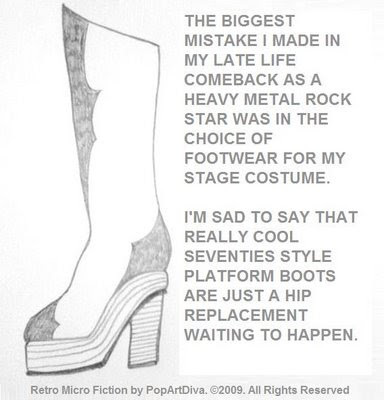 So, when I found myself doodling this retro style platform boot straight out of the seventies and a KISS concert and thought I'd do a little micro story for you guys too! 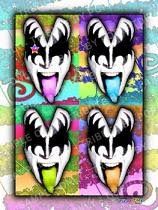 My Art Tribute to Gene Simmons of KISS.. This image is not for sale it is only a tribute to a pop icon. © PopArtDiva.com 2002 - 2009. All Rights Reserved. LOOKING FOR THE SATURDAY SOAPBOX? Check the latest Saturday Posting! Unless otherwise noted, all images and art on this site are © PopArtDiva.com 2002 - 2009. All Rights Reserved. Baby, Have I Got Some Retro Nostalgia for You! HAPPY ST. PATRICK'S DAY 2009 - Céad Míle Fáilte! BARBIE TURNED 50 - She's a Boomer Now! SOAPBOX SATURDAY - Wasting our Elders?